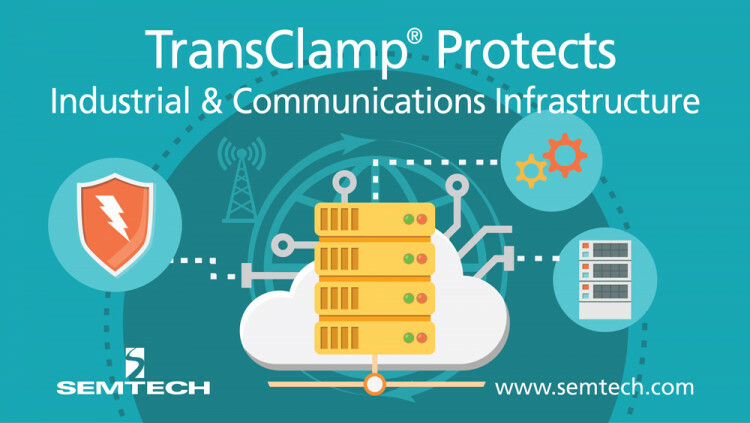 Semtech Corporation (Nasdaq: SMTC), a leading supplier of high performance analog and mixed-signal semiconductors and advanced algorithms, today announced the newest member of its TClamp® low capacitance surge protection platform. This new two-line TVS array offers high-surge, low-capacitance transient protection in an ultra-small footprint. Optimized for safeguarding Telecom and Industrial data interfaces from dangerous transient voltage threats, the device also minimizes capacitive loading on high-speed interfaces. Targeted at the Telecom industry’s surge immunity requirements, Semtech’s new TClamp array offers an impressive 120A (8x20µs waveform) of surge immunity and is housed in a very small 2.6mm x 2.6mm QFN package. This product exceeds the industry standard requirements for electrostatic discharge (ESD) immunity, delivering best-in-class clamping voltage performance and a minimal line-to-line capacitance of less than 5pF. • 3.3V working voltage protection with Low capacitance (<5 pF line-to-line)High surge capability: 120A (tp=8/20μs) on 2 I/O lines (1 differential pair) Pricing and Availability The TClamp3312N (order code: TClamp3312N.TCT) is available immediately in production quantities and is priced at $1.36 each in 10,000-piece lots. Semtech offers comprehensive design assistance, including field- and factory-based support. Data sheets, volume pricing and delivery quotes, as well as evaluation kits and samples, are available by contacting info@semtech.com. Semtech Corporation is a leading supplier of high performance analog and mixed-signal semiconductors and advanced algorithms for high-end consumer, computing, communications and industrial equipment. Products are designed to benefit the engineering community as well as the global community. The company is dedicated to reducing the impact it, and its products, have on the environment. Internal green programs seek to reduce waste through material and manufacturing control, use of green technology and designing for resource reduction. Publicly traded since 1967, Semtech is listed on the NASDAQ Global Select Market under the symbol SMTC. For more information, visit www.semtech.com. All statements contained herein that are not statements of historical fact, including statements that use the words “designed to,” or other similar words or expressions, that describe Semtech Corporation’s or its management’s future plans, objectives or goals are “forward-looking statements” and are made pursuant to the Safe-Harbor provisions of the Private Securities Litigation Reform Act of 1995, as amended. Such forward-looking statements involve known and unknown risks, uncertainties and other factors that could cause the actual results of Semtech Corporation to be materially different from the historical results and/or from any future results or outcomes expressed or implied by such forward-looking statements. Such factors are further addressed in Semtech Corporation’s annual and quarterly reports, and in other documents or reports, filed with the Securities and Exchange Commission (www.sec.gov) including, without limitation, information under the captions “Management's Discussion and Analysis of Financial Condition and Results of Operations” and “Risk Factors”. Semtech Corporation assumes no obligation to update any forward-looking statements in order to reflect events or circumstances that may arise after the date of this release, except as required by law. Semtech, the Semtech logo and TClamp are registered trademarks or service marks of Semtech Corporation or its subsidiaries. Third-party trademarks or service marks mentioned herein are the property of their respective owners.